Learn more about the REED Instruments R2050 Thermal Imaging Camera. Includes features, pricing, and answers to common questions. The REED Instruments R2050 80 x 80 px Resolution Thermal Imaging Camera is an entry-level thermal imaging camera featuring an infrared sensor, video recording, and auto hot and cold markers. Infrared resolution of 6,400 pixels. Vivid 2.8" color LCD display. Built-in laser and white LED flashlight. Pros: IR sensor, able to take infrared and visual images, voice connotations. Cons: Not WiFi enabled, no auto-focus. Bottomline: Great thermal imaging camera for electrical and mechanical inspections. The REED R2050 thermal imaging camera retails for $1,195.00. R2050 80 x 80 Thermal Imager. 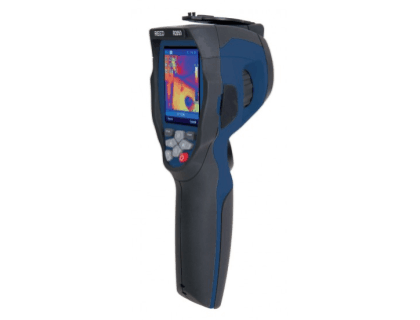 Can the REED R2050 Thermal Imaging Camera display both thermal and normal images? Yes, the REED R2050 can display thermal and visual images, and has the ability to take infrared and visual images and record video with audio (voice annotations). What is the resolution of the REED R2050 digital camera? The digital camera is 5 MP. Where can I buy the REED Instruments Thermal Imaging Camera? You can buy the REED R2050 thermal imaging camera online from sites like Amazon and Walmart. What are some REED Instruments Thermal Imaging Camera alternatives? Flir One Pro USB-C Thermal Imaging Camerea.